This week has been a doozy. I’ve been running around like a chicken with its head cut off, scrambling to get caught up with work before I jet off to New York City (New York City?!) for the next few days. By the time this post goes live tomorrow morning, I should be well on my way! Footloose and fancy-free we’ll be tonight once we find authentic New York pizza and a bar with many taps. That’s all we have on the itinerary so far—I haven’t had time to research where to go, what to do and perhaps most importantly, where to eat in NYC! Please, tell me what I can’t miss. I know you all will know just what I should do! 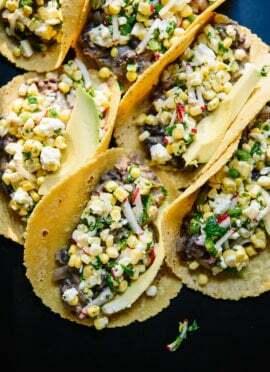 If one of my raw kale salads got with my black bean tostadas, we’d get these baby burritos. Stuffed full of beans ‘n greens and brightened with lime and feta cheese, they’re a little spicy and entirely delicious. By my fourth burrito, I had my method down to a science; I can roll up one of these babies in less than 10 minutes flat. They’re just the right size for me, but if you’re feeding a hungry boy, you might want to buy bigger tortillas and double the amounts listed below. Enjoy! This simple burrito recipe is filled with cooked black beans and lime-marinated greens. It’s healthy and packed with flavor! You’re going to love it. In a bowl, combine the kale, cilantro, jalapeño, lime juice, olive oil, cumin, chili powder and sea salt. Mix well and set the bowl aside to marinate. Warm the beans and minced garlic with a couple of tablespoons of water. You can do this in your smallest sauce pan on the stove over medium-low heat (sauté the garlic in a drizzle of olive oil before adding the beans) or in a bowl in the microwave. Add little splashes of water as necessary. Use a fork to mash up the beans a little and add salt to taste, if necessary. Warm the tortilla in a skillet or in the microwave for a few seconds. 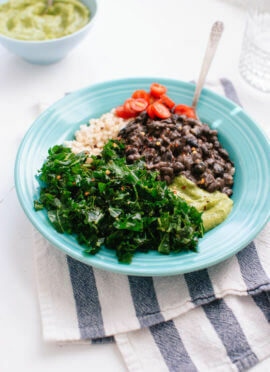 Top the tortilla with the black bean mixture, sliced avocado and marinated kale (you may end up with more kale than will fit in your burrito, which you can serve on the side as a salad). Top with red onion and feta. Roll up the burrito by first folding the tortilla over from the bottom to partially cover the beans and greens, then fold in the 2 sides; finish rolling and put the burrito seam side down on a plate. Slice in half, if desired, and serve with sour cream or plain Greek yogurt on the side if you’d like. Recipe adapted from Mark Bittman’s beans ‘n greens burrito in The Food Matters Cookbook and Ashley’s jalapeno and lime marinated kale tostada. Make it vegan: Omit the feta. Make it gluten free: Use a gluten-free tortilla. Milk Bar and Noodle Bar FOR SURE. Candle Cafe for healthy eats. Abraco in the east village for coffee. Pies ‘n’ Thighs in Williamsburg for brunch (and amaaazing doughnuts). Meatball Shop is fun and rowdy. Parm makes mozza sticks from fresh, house-made mozzarella. Babycakes for a cookie sandwich… I could go on and on. We leave tomorrow. So stooooked! Wow, your burritos are so clean and amazing looking! So bright and cheery! Enjoy NYC, I’ve heard it’s a fabulous and magical place. i love the raw kale twist, sounds delicious. i would love to go to NYC one day! enjoy your stay. I’m going to make these RIGHT THIS SECOND. Have fun in NYC! Not jealous at all. You’re in my city?! Ahhh – so exciting!! Email me if you want any recommendations on good places to eat and drink your face off! Oh! 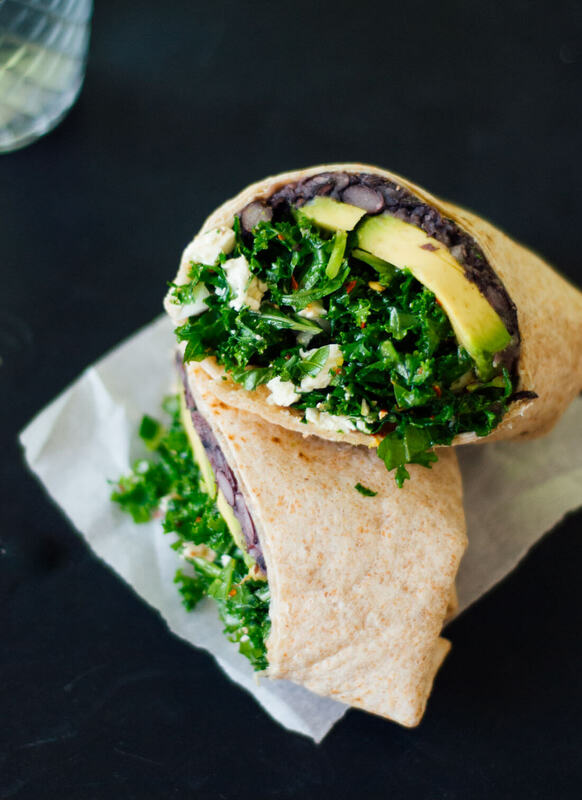 And these burritos (at least a version involving kale and black beans) are lunch today (yipee!). You’re burrito shot is perfect! I love that you used a raw kale salad for the greens too! Have fun in NYC – if you’re visiting the Upper West Side, I’d recommend Spiga and Bistro Citron – I’ve had fabulous meals at both places when visiting my sister. Burritos look enticing + Have a wonderful time in NYC! Love this idea for another quick and healthy meal. Have a great time in NYC! Whoa! Looks like the perfect summer lunch – yum! As for places to eat in NYC, I’d recommend Roberta’s, Diner, Cookshop, Northern Spy, or Back Forty for sit-down meals; Caracas Arepa Bar, grilled cheese from Milk Truck, or Taim Falafel for cheap eats; and Billy’s Bakery, Momofuku Milk Bar, or Big Gay Ice Cream for dessert. Have so much fun!! For awesome veg food — Angelica Kitchen (bring cash), Blossom, and Candle 79 (if you have extra $ to drop). Non veg, but “farm to table” with lots of options, The Dutch. I hope you have the best time in NY! I think going without big expectations and an overwhelming list of to-dos is best, anyway. If you’re in Brooklyn, Pok Pok Wing just opened in Red Hook! amazing Thai food! Enjoy! 1. For cheap eats, El Cocotero in Chelsea serves Venezuelan food–plenty of food for vegetarians. It’s the only place I’ve been twice. 2. Pure Food + Wine in the East Village is $$$, but fantastic. All vegan and organic and even my omnivore husband said it was the best meal he had. 3. Pizza: John’s of Bleecker Street and Grimaldi’s in Brooklyn. Tip: get to Grimaldi’s around 6 and leave just in time to walk across the Brooklyn Bridge back to Manhattan at sunset. THIS IS A MUST. 4. Vegetarian Dim Sum House, 24 Pell St in Chinatown. So good. Also, get a foot massage next door and then you’ll be good to walk around and explore. 5. More cheap eats: Sacred Chow. I wanted to take this place back with me to Nashville. It was so good. 6. For a potato fix, Veselka on the Lower East Side is fantastic. There’s also a Belgian frites place with dozens of sauces nearby, but I can’t remember the name. 7. And there’s Bouchon Bakery, Grom Gelato, and Milk Bar and so many other great places. Don’t bother with Magnolia Bakery. Clearly, this is a passion of mine. :) Enjoy your trip! Great idea using raw marinated kale in these. Love it. Splurge on Lil’ Frankies at the center of the universe (1st ave and 1st. st. – Lower East Side) for amazing handmade pizza and pasta. And if you make it to Brooklyn (my hood) I’ve got a bunch more, cause Brooklyn’s really waaaay better than Manhattan any day! You wrapped that burrito like a pro! I always have to get my burrito-obsessed husband to wrap them ~just so~ because mine tend to fall apart. I especially love the addition of avocado – can’t go wrong with that! NYC is a BUSY but exciting and fun trip. It’s amazing how much ground you can cover in a few days. Have a great time! thank you for this YUM simple recipe. I’m going to make them right now! for NYC, Angelica’s is my fave. I’m going to check out all of the other suggestions too! Hooray- I’ve got all the ingredients for this one already (subbing gluten-free corn tortillas for flour ones)… I’ll try and give this one a shot tonight. Thanks for the inspiration! I like to go to Caracas and Babycakes when I’m in NYC….and eventually I’ll have to check out the risotto place (Risotteria?) on Bleeker. So many gf options in NYC, wish we had options like these in Honolulu! Have fun! Enjoy your time in my beautiful home town! and of course – EATALY!!! John’s Pizza on Bleeker, Mamoun’s Falafel, & Bar Pitti were a few of my old haunts – I did love Locanda Verde when I went a couple of years ago. The Burger Joint is awesome, but not sure on their vegetarian options but the french fries are really good though! Oh, and you HAVE to get the olive oil gelato from Otto. Favorite.dessert.ever. Kate if your in NY you need to visit Candle Cafe, amazing Vegan/Vegetarian food. I’ve been making a bunch of your dishes lately and I’ve been loving it. Keep up the good work. Those burritos sound like a wonderful flavor combo. Avocados are just so tasty and I’ve never tried them with kale. Yum! Hi Kate, This recipe is awesome!! What a great idea. And your photos are gorgeous. If you’re ever in Paris, know that someone (me) is working hard to get kale in Paris markets and restaurants! Keep eating well! 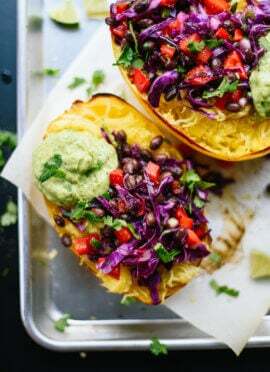 These look amazing and perfect for when I’m sick of just salad on it’s own! Love that, Autumn! Thanks for reminding me about these burritos—they’re just the kind of meal I want to eat while I get settled into my new place! Made this tonight finally, and it was so freakin’ delicious. I used queso fresco instead of goat cheese. I could eat this every night. Queso fresco sounds like a great sub. I need more of these burritos in my diet! Just made for lunch today. Delicious!! The whole family, including two teenage boys, loved them! Hooray! Glad to hear it, Lisa. Well, hello from another Kate. You can only get kale in the fall/winter where I live, so I’ve been biding my time since the spring, just waiting to give this recipe a try. We finally made it, and yum! Love it. Added a little more jalapeno, but that’s it. Thank you! Made this for dinner tonight and it was FABULOUS. Didn’t change a thing. Thanks for the recipe. If I made one of these the night before and then took it for lunch the next day, do you think that the dressing for the kale would make it al too soggy by the next day? Hi Mekayla, that’s a great question, and I’m sorry I haven’t responded to it sooner. I seem to remember the burrito leftovers being pretty good the next day, though not quite as good as on day one. The kale will hold up to the dressing, and there isn’t so much dressing that it will turn into a soggy mess. The avocado might brown a little, though. You could skip the tortilla and turn it into a salad if you’re worried about the tortilla. These ingredients are great together in any combination! Just found your blog (where have I been??) and made these and would now like to be besties?? ;) Delicious! Just made and ate this burrito for the first time and didn’t even clean up yet because I had to comment first… so delicious! This recipe has given me knew hope that one day in fact I may be able to turn vegetarian! =D So glad I found your blog, I was really bored of my limited cooking repertoire. Thanks for sharing! Thanks, Adi! Really glad that you found my blog, and enjoy the burritos! Hey Katie, I’m glad you enjoyed the burritos so much! I’m sorry, I don’t have the nutritional breakdown for them, but it seems like they should be pretty good for you. I always try to buy the smaller whole wheat tortillas that don’t have a long ingredients list… not sure if that is a factor in the calculations. We made your burritos last night and they were delicious! We didn’t change a thing. Thanks for creating! Thank you for writing such clear and concise recipes! I love the fact that all the important details are upfront (time, serving sizes, etc.) and that you offer ingredient substitutions for hard-to-find items! I find most of my recipes on blogs, and a well written one makes a HUGE difference. Seriously, thank you. Thank you, Pip! I work really hard on my recipes and I’m glad you appreciate them! I’ve had these bookmarked for weeks and *finally*made them for lunch today. I made a much larger batch with an entire bunch of kale… hoping the kale stays okay for a couple of days because I’m lazy like that. Aaaaaanyway, fantastic. Loved them. Thanks for a great recipe. Awesome! Thanks, Rachel! Hope those burritos kept well for you. These were amazing! We aren’t vegetarians, but I do try to eat more vegetable based dishes after my husband makes a more meaty (usually grilled) dish to balance things. :) I looked up quick vegetarian recipes, and your site came up. We have to avoid tomatoes and spice for my daughter, but these were perfect. And so quick, too!! And it tasted AMAZING! Thank you so much for sharing your recipe. Thanks, Christine! Your burritos sound awesome! Now I want to try your version. I found your blog searching for meatless recipes on pinterest and I’ve been having so much fun trying your recipes. I made these for my family last night and they were so good that we made them again tonight! I had mine as a salad and enjoyed every bite. Definitely a keeper recipe! Thank you! Thank you, Kate! I’m glad you found my blog! Yay! Eating this now on New Year’s Day 2016. Delicious and healthy. This is definitely going to be in the lunch rotation for this year. Thank you, Joy! Happy New Year! These look amazing! Do you think they would freeze well for a quick breakfast to go? I’ve never tried freezing a recipe with kale before. Hmmm, I’m not sure! I would lean towards no, at least not if you want the kale to retain its raw texture. Another recipe that’s right up my street, looking forward to giving it a try! Thank you! Thanks for sharing this idea; I can’t wait to try. I just had to comment in case anyone finds this recipe since it’s been several years now since it’s been posted. You have to make this!! I’ve been making this for about 2 years and it’s so good! My husband and myself both love it and during the summer when we’re getting a lot of kale from our csa we usually rotate between 3 different dishes to use it up, this dish being one of them. Love this, but how would you increase the ingredients to serve a group, say 6 people? I’m unsure of exact measurements. Thanks! Just made and ate this yummy recipe. It took about 15 minutes, pretty easy and super tasty. I love all the flavor! Keep ’em coming. I can’t wait until I’m hungry again to have another one. Happy to hear this, Deb! OMG I can’t believe I have had this recipe in my to make now folder for 5 years – mourning all of the incredibly delicious boldly flavored burritos I could have enjoyed in that time not to mention the ahem few bunches of unused kale that I could have rescued from the compost pile. Kate you always provide the most yummy boldly flavored health-full recipes (if i say healthy my adorable mother in law will start haunting me.) I hope you think this is a compliment because I do, when my husband LOVES something I make, he always asks, is this from the one with the dog? Invariably it is and he says, I KNEW it. Thank you for making our transition into vegetarians so so simple, it’s been a year and two months now and his friends are starting to get envious after disparaging him in the beginning. I came across Cookie and Kate a little while ago, and didn’t really want to give her a try. We had the lemony noodles with collards and I was HOOKED. This was A.M.A.Z.I.N.G!!!!!!!! I didn’t realize that the recipe only makes 1, so we had to quadruple everything to make it a dinner. The kale was a bit too spicy by itself, but with everything it was so good!!! My 21 month old loved the burrito too. We make a lot of burritos and the beans don’t always come out as flavorful. We will be making these burritos at least twice a month…maybe more. I’m glad you finally tried something from C+K, Sarah! Burritos on regular rotation is a great idea– they’re such a simple, nutritious meal! That is freakin’ delicious. I recommend going heavy on the lime juice and leaving it marinating for ages to help the acidity soften the kale. Also leave the jalapeno seeds in for some kick! Fabulous recipe, Kate! I absolutely love the kale-onion-feta combo… perfect compliment to the beans. We like things extra spicy, so I stirred some cayenne and dry sriracha seasoning into the Greek yogurt–yum. Since that was too much heat for my little boy I added some diced mango to his burrito, which was amazing!! We’re trying to reduce our meat consumption, so I’ll definitely be back to try some of your other recipes. Thank you! Absolutely loved this recipe and it got a big tick with my hubby for the amazing flavours! I am trying to do veggie meals throughout the week and meat on weekends…which is a massive change for my meat-loving hubby. This is my new favourite site for recipes! Thank you! WOW ! It could be because my expectations were low-ish (or at least, not HIGH), but this is probably one of the best things I’ve made in a while!!! This burrito came together in literally 7 minutes, all with pantry ingredients (I happened to have Tuscan Kale in the fridge and I ALWAYS have cilantro). What a simple, fresh, tasty little wrap! This will definitely be my default lunch when I don’t have leftovers! Made this 2 days straight family loves it!!! Thanks!! Such a genius idea, and such beautiful simple recipes. Thank you for the Kale and Black Bean Burrito recipe. My girlfriend and I really enjoyed it. Can’t wait to try this! Thank you for these a awesome recipes! Tasty and pleasant!! Nice and warm burrito and i love the marinated greens…would have never done that on my own. I’m glad you think so, Liz! Glad to have provided some inspiration. I had really high hopes for this recipe, but sadly it didn’t deliver. It tasted like it was really missing something but I couldn’t put a finger on what. I’m sorry you felt that way! You could always increase your favorite spices. I have made this meal over a dozen times over the course of the year. Adjusting it a bit to my own taste but for the most part sticking to the list of items and measurements as they are written, it is easily one of the more delicious, nutritious, and life-sustaining lunches that I bring with me. I often add either or both chopped red peppers or cherry tomatoes. When I bring it for lunch I typically bring a container with the filling with a dollop of yogourt on top of it, and in a separate bag the pita bread. I assemble it when I’m ready to eat to prevent the pita bread from getting soggy. I also typically make a HUGE batch of it to eat it over the course of a few days, and it hands down only gets better each day. Thanks so much for this fantastic recipe! Happy to hear this is a regular for you, Emma! Thanks so much for your comment and review. I visited NYC once forty years ago and hated it with a purple passion. I hope you enjoyed it more than I did. I am on a strict meal plan to meet a body goal in the next month, this dish is AMAZING! I just tried it. The cook time was not long at all and all the flavors plus the yogurt, meshed so well! My coworker hates vegetables and I tricked him into having it ! Success! This will not be the last time eating this for sure ! Thank you, Brittany! I’m glad it was a hit. I made these last night for my family of six. My seventeen year old son helped me make them. I thought he would complain or make smart remarks while we made them, but he actually made one for himself and I didn’t here any complaints. Also, I was thinking my other kids would be skeptical and not want to eat them. I didn’t hear one complaint throughout dinner and all my kids loved them, and ate everything in them. They didn’t even open up the burritos to see what was inside (which is usually what happens), haha! It’s always a score when you find something healthy that your kids like. Thanks for the recipe. They were delicious! That is a win, Sharon! I really appreciate you sharing. Thanks so much for your review!